If Russia wants to be a successful player on the global market, it needs to be more intensive about integrating its education system into the international system, according to participants at the 2014 Open Innovations Forum in Moscow. The future of the education system might arrive much more quickly than anyone could imagine. 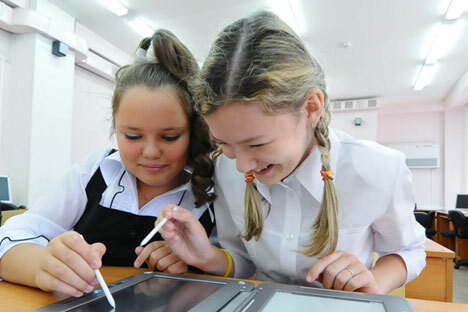 For this reason, if Russia wants to be a successful player on the global market, it needs to be more intensive about integrating its education system into the international system, experts said at the 2014 Open Innovations Forum in Moscow. By 2020, Russian universities will start training specialists in completely new programs: energy meteorology, IT medicine, genetic consulting, airship design, environmental auditing, cosmobiology, and cosmogeology. These and many other new specializations are listed in the Atlas of New Professions, published by the Agency for Strategic Initiatives and the Skolkovo Moscow School of Management this year. “The future is unevenly distributed. For example, we already live in the year 2025 in terms of the availability of information and technology,” Creative Director and co-owner of the Nordic Agency Leonid Bugayev told RIR at the Open Innovations Forum. However, according to many of those who participated in the conference, it will take time for innovation and innovative approaches to become the norm in Russia, and Russian education needs to become part of the global education system. “The new generations are born into a digital world,” Alexander Laszlo from the International Society for the Systems Sciences told RIR. This realization is already forcing companies like Finnish video games developer Rovio Entertainment – the creator of Angry Birds – to design interactive and engaging educational programs for schoolchildren. The company even has a vice president for education. What Rovio does is the perfect example of the so-called gamification of education. “The more opportunities kids have to play, the more opportunities they have to learn,” the Angry Birds maker’s marketing director Peter Vesterbacka told RIR. There is no equivalent of Rovio in Russia, although the Russian government is taking several steps in that direction. “For example, the Russian Ministry of Education and Science is motivating publishers of [school education] content to transfer it from paper to electronic devices. And these aren’t just electronic copies of books, but interactive content,” said Yakov Mendeleyev, who runs the development department of a project called E-School of the Future, run by telecom provider Rostelecom. Even now, technology in schools – although far from every school, unfortunately – involves not only working with ordinary children, but also engaging children who were previously never included in the full educational process. For example, Samsung has launched a program called Education for Everyone in Russia. “This is a program for special needs children who are homeschooled. For them, technology is the only way to socialize and get an education,” said Sergei Pevnev, marketing director for Samsung’s Russia division. These children, who are growing up in the digital age and have never known life without the internet, will enroll in university not in a decade, but in just a few years. This will fundamentally change how information is presented and digested at universities. “Gamification of education is engagement. You move from story telling to story playing,” Alexander Laszlo told RIR. “The main challenge is to engage a student's brain, to engage him where he lives and with challenges that face him in his particular life circumstances,” he added. In Laszlo’s opinion, it is still unclear how higher education will tackle what he considers to be its main challenge – involving students in education. However, some elements of the future are already present; again, not at all universities, but where there is a request from specialists on the part of the business world. “Our programming program [the Samsung IT School] is offered in 20 regions. It’s impossible to maintain a unified standard and level of quality without using mobile technology, webinars, and online testing,” said Pevnev from Samsung. According to him, this practice will be actively borrowed by classic universities as well. “Besides mobile technology, we see the possibility for Russian universities to build individual educational technology in the future that takes into account each student’s individual needs,” Pevnev said. Michael Stopfold, the executive director of American company Weber Shandwick, thinks that Russia already has the technology; the key task facing its universities is now to ramp up international partnerships and continue to integrate into the global education system. “Russia has fantastic technology and innovation in education, but these technologies and innovations should make sure they have international partners,” Stopfold told RIR.